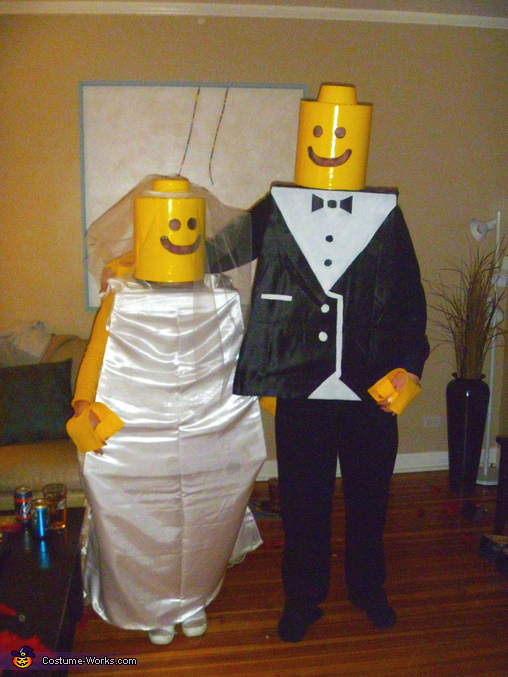 My boyfriend and I are wearing a Lego bride and groom costume. I saw a couple of pictures of other lego costumes online and knew it was something we could make on our own, so we decided to go with a bride and groom for extra emphasis. The whole costume is made with cardboard boxes, fabric from the fabric store, cement molding from home depot which we painted with regular glossy paint for our heads. The rest was just made with extra touches of fabric paint, lace, and a handy box cutter. We blew everyone away at the party we went to.